We can integrate your environmental controls from a common intuitive user interface, allowing for less clutter in the room. Liquid Automation’s lighting control packages can have total control of all your lighting, along with the ability to conserve lamp life and power consumption. 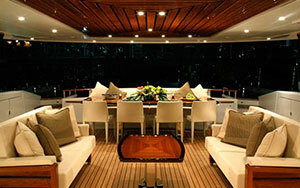 You can control your vessel’s lighting from a touchpanel or a remote rather than a wall of switches and knobs. Our system has been proven through vigorous marine testing and is unaffected by varying voltage and frequencies induced by the vessels generator. Liquid Automation’s Shading Solutions include: roller shades, drapery track systems, skylight shades, and beautiful fabrics to enhance the décor of any space. Heat and humidity are always a challenge for our equipment on yachts. To combat this, we use temperature sensors to monitor and log information via the sensors put into each area where our equipment is located. At a certain temperature, a warning will be sent. If a maximum set temperature is reached, the equipment will be shut down along with alerting crew and automatically emailing our support team.